It’s amazing how God made little baby bodies. After the wicked tumble off the changing table that LL took, I thought for sure she’d be brain damaged in some capacity, especially when the ER doc sent us home with paperwork on “Child Brain Injury!” Seriously, way to scare the crap out of new parents. Sheesh! I think that the medical field exists to torment new and unsure parents sometimes…I digress. Yes, LL has had quite the rapid recovery…no obvious damage and in the last 4 days she has become super MOBILE! She is no longer content to just roll around on the smallish area rug. Oh no, that will not do! 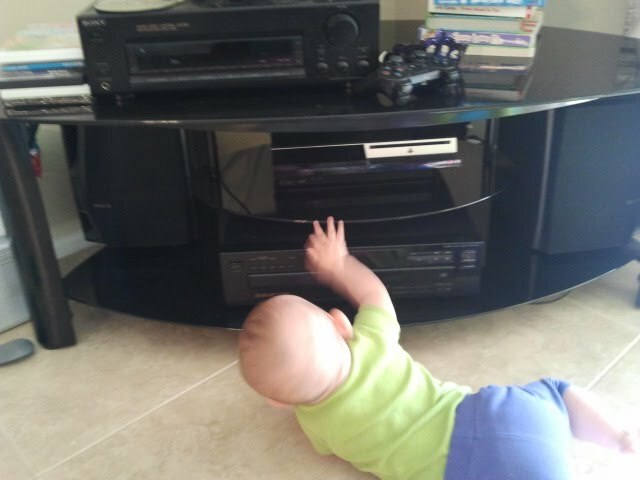 She has managed to crawl…ok army crawl if you want to get technical, from one end of the house to the other. Just today she was perusing the bookshelves, aka Visaggio Reference Library, eyeing up the Teaching Science as Inquiry and 7 Keys to Comprehension education section when she finally decided on none other than Webster’s Unabridged Dictionary. At least it seems we’re raising a brainiac 😉 if not a daredevil! So what to do about baby-proofing?? Obviously we need to bolt the bookshelves to the wall asap. Outlets are plugged. Cords are stored and tied back. Doorknobs are covered…and honestly, that’s the one that drives me bananas! I can’t open the freakin’ door without an added 5 seconds each time…sigh. My to do list consists of just putting the cabinet locks on. I think that will do. I’m not sure what else there is to do. I contemplated moving breakables up higher. But then again I kind of want to teach her not to touch those things. Am I begging for trouble? Probably. Will it be more work for me? Definitely. But really how much of my house am I supposed to remove or rearrange??? Did you know that there are actually businesses whose sole purpose is to baby-proof your home? 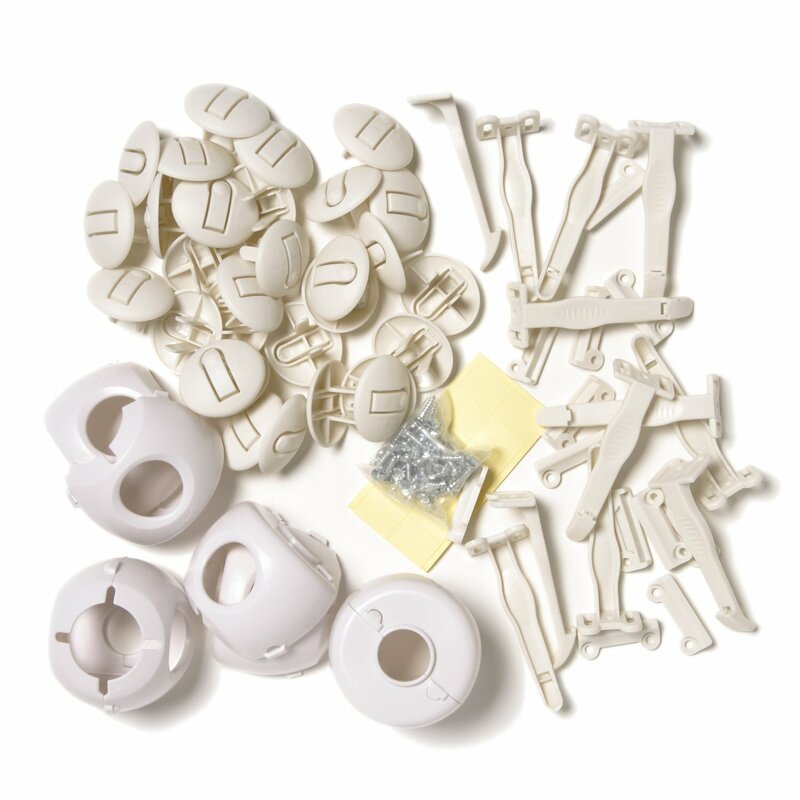 Take a look at all the gadgets on babyproofingshop.com! I mean really, how many ways can you lock down your toilet??? Why not just shut the door to the bathroom is my first thought. But then again, my little daredevil can’t get into the bathroom…yet. In what ways did you baby-proof your home? Is there a face-palm baby-proofing idea I’m missing? I am still majorly sleep deprived so I can easily see myself forgetting an obvious item. Please HELP! The last thing we need is a second trip to the ER in a week!! !